Country Terrace is the first long-term care home in the South West Local Health Integration Network (LHIN) to receive ministry approval to perform in-home peritoneal dialysis. Administrator Karen Dann notes Country Terrace first applied for permission to perform peritoneal dialysis nine years ago. However, because people with renal failure are not given priority on long-term-care home waiting lists there were no residents needing dialysis and team members continuously had to have their training renewed. 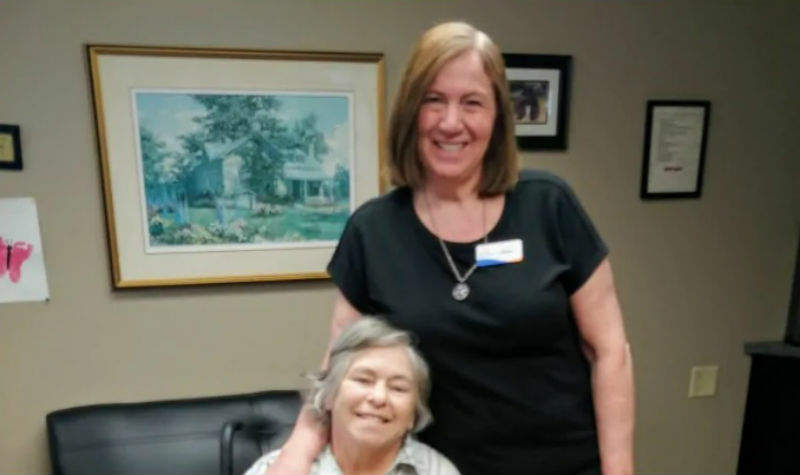 In January, after registered team members received their most recent peritoneal dialysis training, Sharon Hanneman moved into Country Terrace. Sharon, who has renal failure, has become the first resident to receive peritoneal dialysis at Country Terrace. All of Country Terrace’s registered staff members now know how to perform peritoneal dialysis, Karen says, adding she sees great benefit in improving the quality of life for people with renal failure living at Country Terrace. “They will not need to sit in hospital waiting, (and) they won’t need to go to clinics to be managed,” Karen tells The OMNIway. There is another person on Country Terrace’s waiting list who has renal failure, and staff will be able to transfer their skills and experience to helping that resident when they move into Country Terrace, Karen adds. Karen recently learned from the Ontario Renal Network that there are new guidelines allowing people with renal failure to apply for priority status in long-term care homes, so Country Terrace is applying to the South West LHIN to gain this designation. The alternative for people with renal failure receiving peritoneal dialysis is hemodialysis, which is more taxing on patients, Karen says. While hemodialysis, which is done in hospital, involves blood being cleansed by a machine, peritoneal dialysis removes waste products from blood by injecting a special fluid into the abdomen through a catheter.